The Rivierzicht bush camps are situated right there on the banks of the Breede River in the Robertson valley. 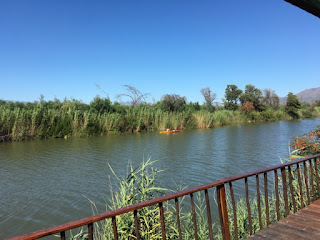 Imagine waking up to the sound of fish jumping out of the water, reeds rustling in the gentle breeze and birds chirping. Yep, that’s what you get when you stay at one of the bush camps on the Rivierzicht resort. The Breede River, about 322km long, starts high up in the Ceres mountains, then snakes its way to the Indian ocean at Witsands. It is the longest navigable river in the Western Cape. There are three dams on the river, the Theewaterskloof Dam, the Brandvlei Dam and the Kwaggaskloof Dam. The Theewaterskloof Dam is one of the major Dams that supply Cape Town with water. 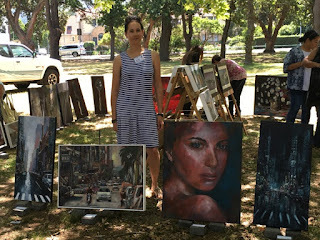 My friends - Devine and Erica - and I spent two awesome hours at the Art in the Park exhibition that was held today. The art exhibition was hosted by the South African Society of Artists. Visitors could interact with the artists who were hosting their own exhibition stalls. We went to support one of our ex colleagues, Mandy Herdien, who is one of the emerging local artists. Mandy was excited to show us how her art has transformed over the years. "I enjoy experimenting with various media and painting techniques. I am currently exhibiting at Kirstenbosch art gallery as well. People are beginning to appreciate my art. I am now in an exciting phase where I can allow my creative genius to surface."